One president. Thirteen years. Seventy-two thousand degrees conferred. This is the legacy of Northern Illinois University President John G. Peters. On Friday and Saturday, Peters presided over commencement activities for the last time, including a Friday evening Graduate School ceremony and three separate events on Saturday. “Commencements are so important. 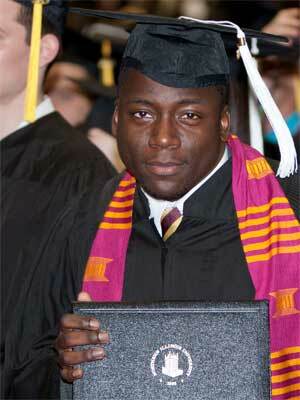 They are the culmination of why universities are in existence,” Peters said. “Even though we are a comprehensive research university, we are all about the training and educating of undergraduate and graduate students and professional students. Early Saturday evening, at the end of the third commencement ceremony of the day, Peters shook hands and congratulated the last of more than 3,000 graduate and undergraduate students receiving a degree this spring. 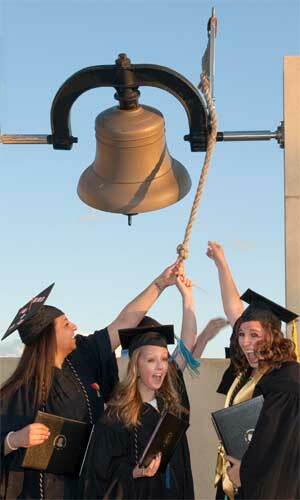 New NIU grads ring the bell outside the Convocation Center. 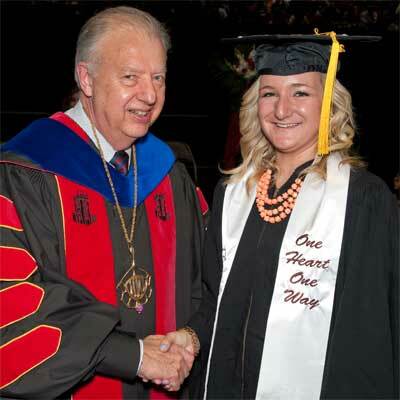 Grace Reynolds, a kinesiology-exercise science major from Rockford, was the last one to receive her degree. She said she enjoyed her experiences in the College of Education and the professors that brought the subject matter to life. “I loved my major and the professors who were passionate about exercise science and really wanted us to learn,” Reynolds explained. Reynolds said she made lasting friendships at NIU, and her experiences in the Greek system as a member of the Sigma Kappa sorority provided memories that will last a lifetime. She reflected on the impact President Peters had on NIU and what it meant to be the final graduate to shake his hand and receive a diploma from him. Throughout the weekend, Peters received praise from students, faculty and the NIU leadership. Trustee John Butler thanked Peters for his leadership, noting he had conferred more than 72,000 degrees to students over the past 13 years. “What a wonderful way to go out,” Peters added.